Democracies are in danger. Around the world, a rising wave of populist leaders threatens to erode the core structures of democratic self rule. In the United States, the election of Donald Trump marked a decisive turning point for many. What kind of president calls the news media the "enemy of the American people," or sees a moral equivalence between violent neo-Nazi protesters in paramilitary formation and residents of a college town defending the racial and ethnic diversity of their homes? Yet, whatever our concerns about the current president, we can be assured that the Constitution offers safeguards to protect against lasting damage--or can we? How to Save a Constitutional Democracy mounts an urgent argument that we can no longer afford to be complacent. 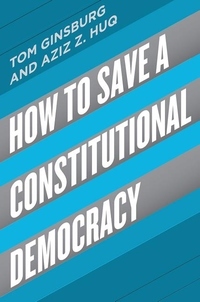 Drawing on a rich array of other countries' experiences with democratic backsliding, Tom Ginsburg and Aziz Z. Huq show how constitutional rules can either hinder or hasten the decline of democratic institutions. The checks and balances of the federal government, a robust civil society and media, and individual rights--such as those enshrined in the First Amendment--do not necessarily succeed as bulwarks against democratic decline. Rather, Ginsburg and Huq contend, the sobering reality for the United States is that, to a much greater extent than is commonly realized, the Constitution's design makes democratic erosion more, not less, likely. Its structural rigidity has had the unforeseen consequence of empowering the Supreme Court to fill in some details--often with doctrines that ultimately facilitate rather than inhibit the infringement of rights. Even the bright spots in the Constitution--the First Amendment, for example--may have perverse consequences in the hands of a deft communicator, who can degrade the public sphere by wielding hateful language that would be banned in many other democracies. But we--and the rest of the world--can do better. The authors conclude by laying out practical steps for how laws and constitutional design can play a more positive role in managing the risk of democratic decline.